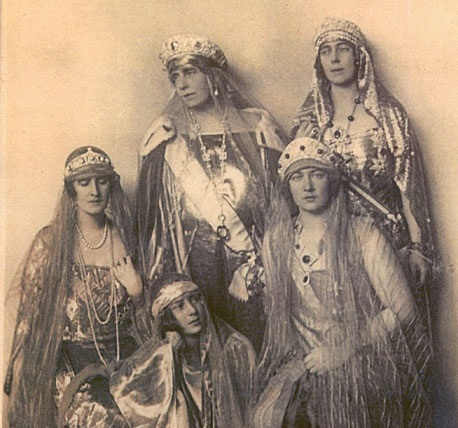 The emeralds came to Greece with Queen Olga, who was born Grand Duchess Olga Constantinovna of Russia. She was the daughter of Grand Duke Constantine Nikolaevich, the second son of Tsar Nicholas I and the younger brother of Tsar Alexander II. Olga was only twelve when she met her future husband, King George I of the Hellenes, for the first time, and she had just turned sixteen when they married. As you'd expect, a Romanov grand duchess marrying a foreign king brought a significant trousseau with her. Among the items that Olga took with her to Greece were a cache of cabochon emeralds, some round, some shaped like drops. The stones were nestled among her other possessions -- including, heartbreakingly, her dolls -- when she arrived in her new homeland. 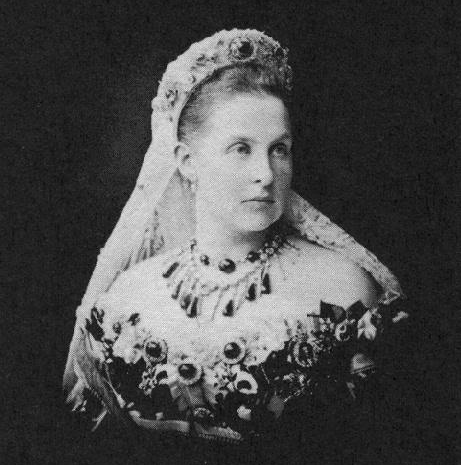 Queen Olga wore her emeralds in various configurations throughout her lifetime. Although the set didn't initially include a traditional tiara, she attached some of the round cabochon stones to a Russian kokoshnik headdress made of stiff fabric. (The largest round emerald placed on this kokoshnik appears to have left the family collection at some point.) She also wore the round emeralds in a choker necklace. The drop-shaped stones were worn as earrings and as pendants on a necklace. She pinned additional round emeralds to her dresses as brooches. In Olga's will, the emeralds were designated to be left to her eldest son, King Constantine I. It's clear that she wanted these particular gems to be a part of the collection of the country's queen going forward, and leaving them to her eldest child was designed to accomplish this. But he died a few years before his mother, so the gemstones were inherited instead by his son, King George II. It was George's wife, Queen Elisabeth, who first ordered Olga's round cabochon emeralds to be set in a tiara. 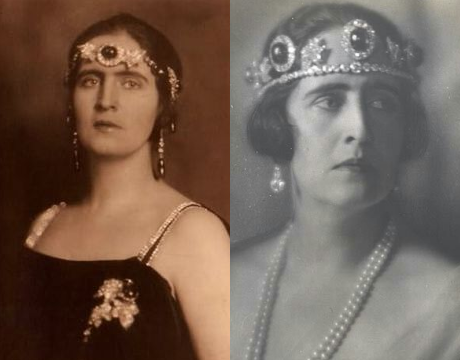 The first versions were various bandeaux formations, worn low across her forehead; the second was the kokoshnik-style tiara that we’re used to seeing today. In one of my favorite tiara touches, Elisabeth had the jewelers use diamonds to create letter E motifs — for her initial — between the emeralds. George and Elisabeth's marriage was tumultuous to say the least, and this tiara is one of its best legacies. 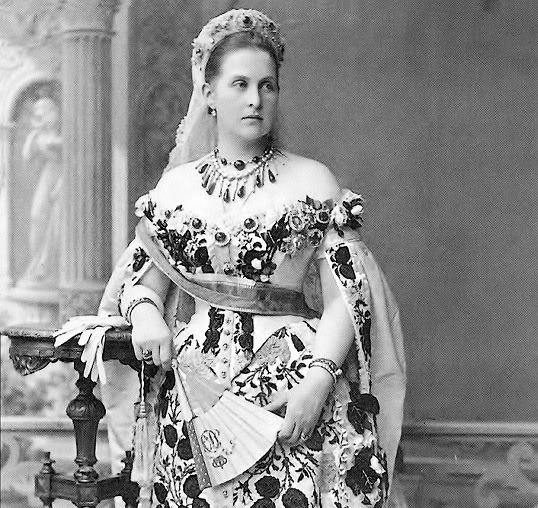 As is the case with most kokoshnik-style tiaras, Elisabeth's tiara is large, resembling a halo encircling the wearer's head. It also had a border of diamonds across the top, but those diamonds were later removed. In an interesting touch, though, this kokoshnik tiara can also be taken off its frame and worn as a rather large necklace. The rest of Olga's emeralds were set in additional pieces of jewelry, forming a parure. Two of the drops are set in a pair of earrings. Some of the round cabochons are set in a large brooch, which can also take several of the pendant drops. But these drops can also be removed and worn in various other configurations, suspended from various diamond necklaces, for example. 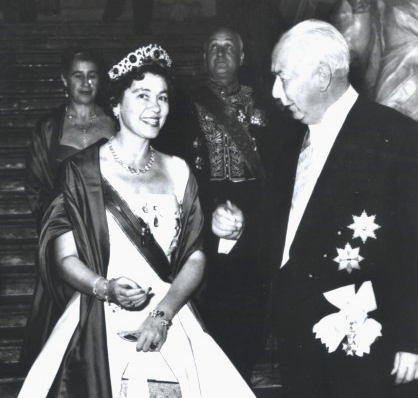 Queen Friedrike began wearing the Greek emeralds when her husband acceded to the throne in 1947. 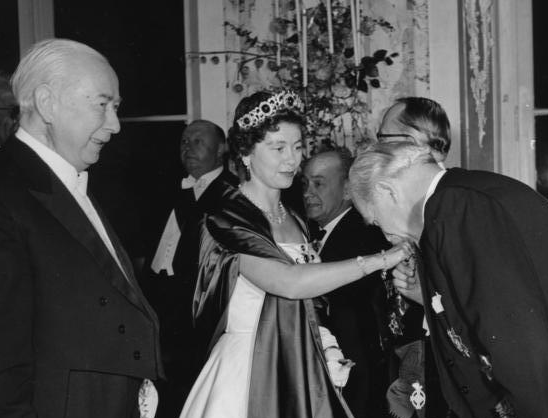 She wears the tiara and the brooch above during a 1956 state visit to her native Germany. 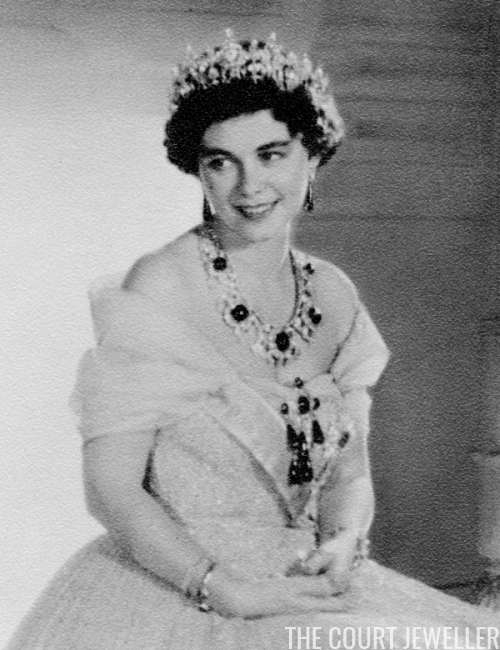 Friedrike even wore the necklace and brooch at the wedding of her elder daughter, Princess Sophia, to Prince Juan Carlos of Spain in 1962. The couple later reigned in Spain as King Juan Carlos and Queen Sofia; Friedrike's grandson, Felipe, is now the Spanish monarch. In March 1964, King Paul died. Only a few months later, Friederike handed over the Greek emeralds to her new daughter-in-law, Princess Anne-Marie of Denmark. 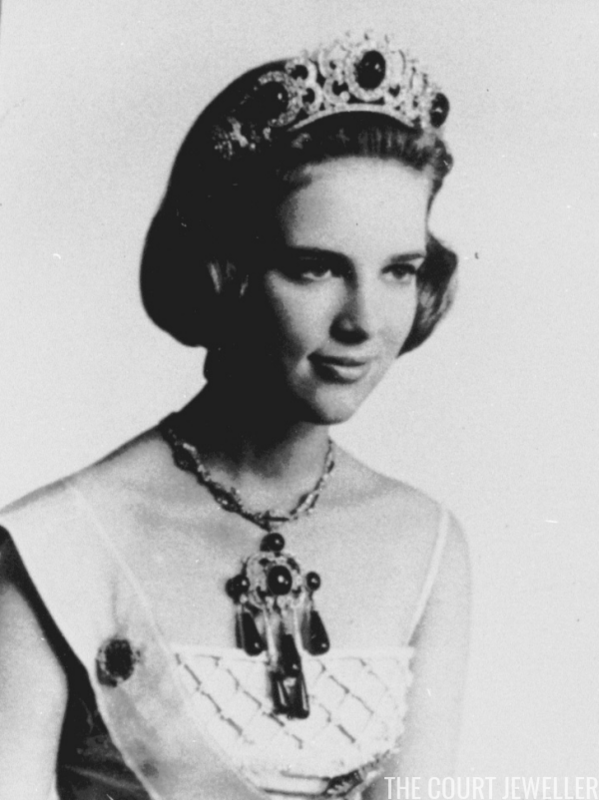 Eighteen-year-old Anne-Marie became Queen of the Hellenes when she married Paul and Friederike's only son, King Constantine II, in September 1964. She wore the emeralds for the first time at a ball held the night before her wedding, and she posed in them for her first official portraits. But Constantine and Anne-Marie's reign in Greece was brief. They fled the country after a coup in 1967, and the monarchy was officially abolished in 1974. Friederike settled in Madrid with Sofia and Juan Carlos, dying there during eye surgery in 1981. Constantine and Anne-Marie settled in London. 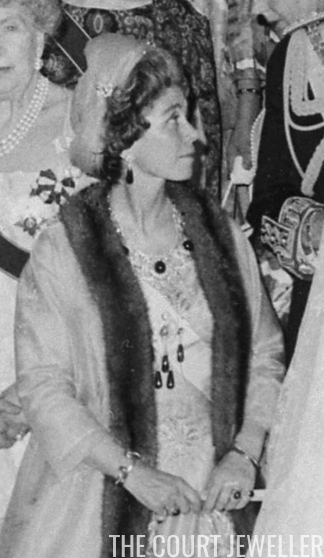 Unlike many royals in exile, the family managed to bring their jewelry collection, including the magnificent emerald parure, with them when they fled. 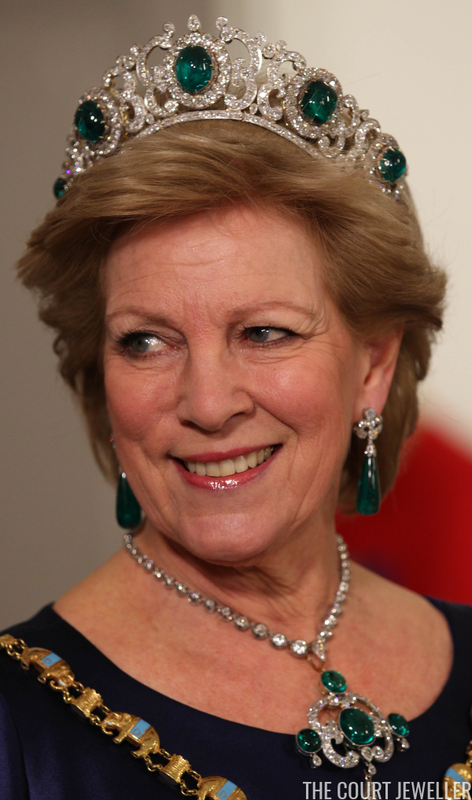 Because of their strong royal ties -- her sister is Queen of Denmark, and his nephew is King of Spain -- they still frequently attend bejeweled royal events, and Anne-Marie often wears the emeralds. Notably, Anne-Marie chose the emerald suite for the wedding of her nephew, Crown Prince Frederik of Denmark, in 2004, as well as for a grand gala in honor of her sister's Ruby Jubilee in Denmark in 2012. 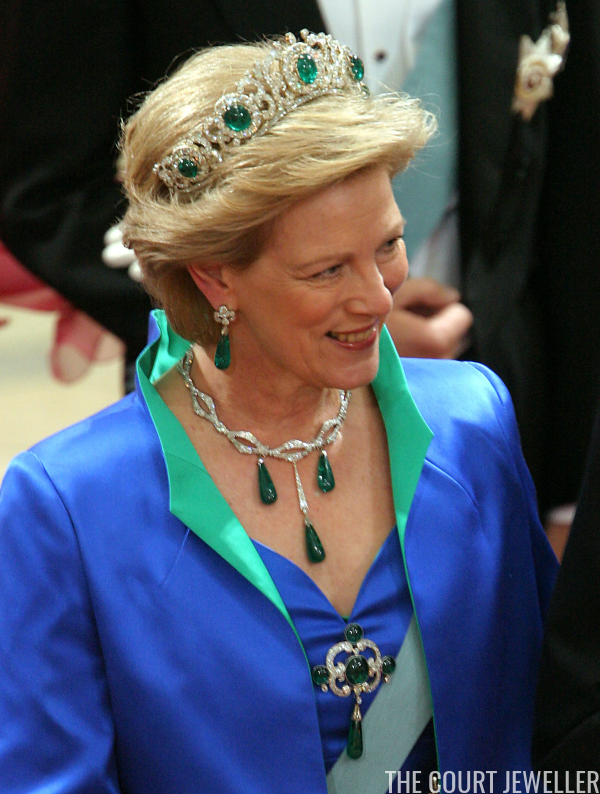 She often wears the Greek emeralds with a piece of Danish royal jewelry: a flexible diamond necklace that belonged to her grandmother, Queen Alexandrine of Denmark.